NUTRITION HEALTH COACHING - PuraVegan Organic Cafe & Yoga - EAT MORE PLANTS! If you are looking to improve and enjoy your life, but don't know how to get started, we can help! It is very normal to feel overwhelmed by tackling the task of switching to a healthy lifestyle. At PuraVegan we have two health coaches available to support you on your path to radiant health! Both coaches offer a variety of services and methods as we know that each individual has different needs and challenges to overcome. Melissa has followed a plant based diet since 2000, and takes that approach with her clients as she truly believes in the healing power of plant foods. Melissa worked in the healthcare field for over a decade and quickly realized the importance of prevention through diet and lifestyle, which led her to embark on her own holistic health journey. She overcame chronic conditions without use of medications, lost 40 lbs of excess weight, and became a health coach so that she could help share this information and empower others. She was certified in 2010 as a Holistic Health Coach from the Institute of Integrative Nutrition and went on to complete a Nutrition and Cancer Course in 2012. 2010, certified as Holistic Health Coach from the Institute of Integrative Nutrition. Lea’s interest in healthy eating began from a young age. Her adoption of a vegetarian diet as a child, and later veganism as a teenager sparked her desire to pursue the formal study of nutrition. She completed her Bachelor’s degree in Nutrition and Dietetics from Southeast Missouri State University in 2015 and has since gone on to earn a certificate in Plant Based Nutrition from T. Colin Campbell Center of Nutrition Studies & eCornell. Lea firmly believes in the healing power of a plant based diet and the empowerment that it brings. 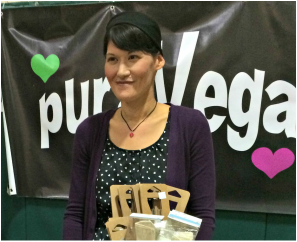 Her goal is to inspire others to incorporate more healthy plant foods into their diets.